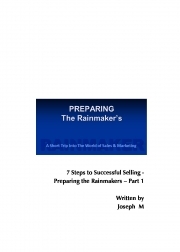 Description of "Preparing The Rainmaker's (eBook)"
The book 'Preparing The Rainmaker's' is aimed at addressing the marketing training requirements for people who are interested to know the dynamics of marketing and sales and pursue as a career. The author has over 2 decades of sales and marketing experience in various industry verticals in the INDIAN region. Most of the basic principles are universal to all products and regions. This is first part and his upcoming book details more on the 7 steps to Successful selling. Joseph is a graduate in Electronics & Communications from the prestigious PSG Institutions, Coimbatore and has over 2 decades of total work experience. He has handled the marketing, sales and operations for leading companies in some of the most demanding business verticals like Banking, Microfinance, IT-Education & Professional Training, Staffing & Recruitment. He is a big proponent of an integrated & blended Training methodology that will help alleviate the skill gap in employability and pave way for right job fitments. He is techno savvy and is very versatile in online media technologies, where smart use of search engines and social media can enable businesses "attract, engage and retain" right customers. He believes that “the functionality of any training must lead to a right fitment and this training must encompass the employability skills that are most needed in today’s job markets “. His specialties also include Creative Campaigns Product Launches, Internet Marketing (SEM, SEO, Social Media etc), Content development, Start-up strategy support and Multimedia Presentations. Joseph currently looks after the overall business strategy, alliances and day to day operations at ITK. Reviews of "Preparing The Rainmaker's (eBook)"
This book is simple and easy to understand the techniques about sales and marketing and also the differences between the sales and marketing, good reference for a professional from this field. The author has addressed the key essentials of sales and marketing which definitely will go a long way for aspirants choosing the field of sales or marketing as their profession.